He's not your stereo-typical chef. No blazing eyes. No thousand decibel Gordon Ramsey scream. Just great food, a calm attitude and a desire to give back. Every Wednesday morning, Chef/Owner Gerard Hirogoyen of Piperade sees to it that his kitchen prepares a nutritious entree especially for donation to Food Runners. Every Wednesday morning at 10:30, Food Runners volunteer Judy E. arrives at Piperade's kitchen entrance to pick up the donation. 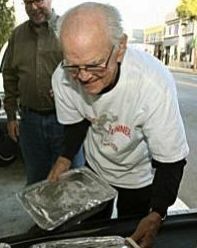 Following smiles and handshakes, Judy loads the food in her car and drives off to deliver it to North Beach Citizens where more, even bigger smiles and handshakes are exchanged. On Tuesdays, volunteer Heather S. prays for parking near Delfina on 18th Street. Once found, Heather runs in and out in a flash. The entree prepared especially for Food Runners always waits for her on a table near the bar. The seniors at Rypins House love Heather and Tuesday afternoons. On Wednesdays, the pans of food for donation at 25 Lusk are so heavy that volunteer Wanda C. gets a workout carrying them up the kitchen stairs to her car parked in the back alley. The folks at the Washburn can't wait to dig in. These scenes are typical of Food Runners Planned Overage program which has been in operation almost since the inception of Food Runners over 25 years ago. Here's how the program works: once a week, participating restaurants prepare a nutritious entree for donation to Food Runners. 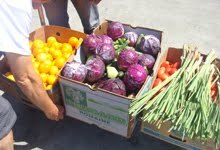 A Food Runners volunteer picks up the donation on the appointed day and then delivers it an agency serving those in need. Simple! Kokkari gets into the act donating 2-3 pans every Thursday. "I can't wait for my run to Kokkari," reports volunteer Sam H. "It's such a great thing these restaurants are doing and my car always smells so good!" On Mondays, Nettie's Crab Shack donates a pan of fresh fish. "I wouldn't miss my run to Nettie's for the world," states volunteer Maria W. "I especially love knowing that the seniors at Broderick Street Adult Residential are getting something healthy." Every Tuesday, Amici's East Coast Pizzeria whips up 10 cheese pizzas for Food Runners. Other Planned Overage participants include: Rose Pistola, COCO500, Le Colonial and Tante Marie's Cooking School. Food Runners Planned Overage program is a local treasure. A real win/win/WIN. In an effort to further express Food Runners' total appreciation for all the restaurants participating in the Planned Overage program, here are additional highlights from the program. Every Tuesday volunteer Tori R. pulls up to the mysterious barn-like back door of COCO500. She pokes her head in and hollers, "Food Runners!" 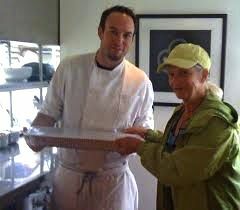 Out comes a smiling kitchen staff member carrying a large foil tray, sometimes two. Off the tray(s) go to St. James' Infirmary where Tori loves delivering. "You just never know who's going to answer the door," Tori chuckles. "I meet some real only-in-San Francisco characters. They're always so appreciative. My Tuesday afternoons are a delight." Parking in North Beach? You must be kidding. Fortunately, Rose Pistola has a white passneger zone right out front. "Picking up at Rose's is so easy," reports volunteer Jane L. "I just pull up, go in and the staff, who is always so nice, hands me a tray of spaghetti or some other kind of pasta with amazing sauce. It smells so good, I'm going to eat there in the near future. I can't resist and I love what they are doing for Food Runners!" Entering Le Colonial from the kitchen stairs is like stepping into Oz from Kansas. From gray and non-descript to vivd color complete with tropical flowers and lush foliage. Every Tuesday afternoon, Chef Brian prepares a delicious Vietnamese style entree, usually accompanied by a full pan of rice, just for Food Runners. "We so loved our food run to Le Colonial," sighs long time volunteer Marcia T. "Now that we're moving to Southern California, some other lucky volunteer will get to enjoy going. We will miss Le Colonial a lot. Especially Brian and the wonderful staff who cares so much." Caring. That's what Food Runners Planned Overage program is all about. Hats off and 1,000 thanks to the participating restaurants.